Fashion designer Matthew Williamson is internationally renowned for being a master of print, embellishment, and kaleidoscopic color. His collections reflect a refined yet spirited sense of glamour inspired by global and artistic influences. This fabulous coloring book shows inspiration shots, behind-the-scenes photographs, sketches, and prints from Matthew's 20-year archive. Includes beautiful drawings of his prints for you to color in yourself. When I first laid eyes on Matthew Williamson's colouring book by the British Fashion designer (who has over thirty-seven thousand followers on Twitter, a range at Debenhams, is internationally known for being involved in London Fashion Week, global creations and more) I was astonished at the detail and unique designs. Like in the image above, on multiple pages there are colourful dresses and prints and the "colour me" part on the right. The one above was one of my favourites by far. Tropical, more autumnal colours have always been a hit for me and this one struck me as intriguing (although I couldn't help but start colouring in multiple pages instead of focusing on one). 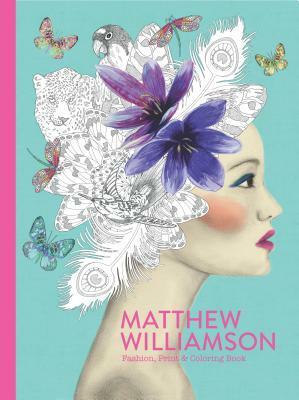 The prints are graphically stunning and eye-catching and from turning the pages I can definitely understand why Matthew is known for being artistic and inspirational with the patterns, lively creations and original pieces (the dragonfly chapter at the start was a favourite!). 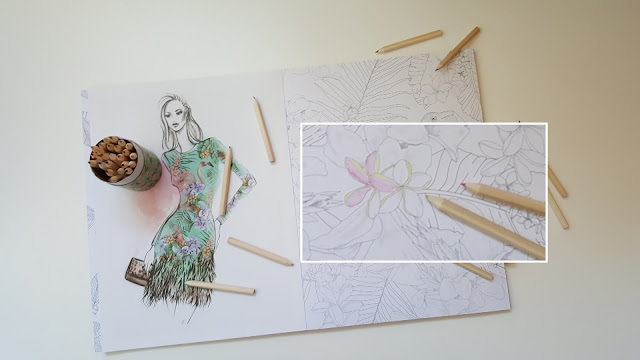 Have you seen Matthew Williamson's Fashion, Print and Colouring Book? What did you think? Let me know in the comments or on twitter @LittleMemoirs! happy reading (and colouring)!